I had just finished a science book job with lots of endnotes, two or three or more per text page in places, almost all of them referring to scientific journal articles with long, complex titles and subtitles, full of technical terms and sprinkled with Greek letters. They were in bibliography style—lead author’s last name first, periods separating the infobits—and needed reformatting into note style. And they were unnumbered notes, so the key phrases that anchored them had to be located in the text; modified if they were too long, short, or generic; and revised if the text had been revised. At midnight the notes seemed neverending, as if every time I finished a page two more popped up, like sharks’ teeth. At 12:30, unbelievably, the last one came in sight. Then came the proofreading in Final to clean up the bits of stray punctuation that get stranded in strange places when you’re moving things around. You can’t see them all among the blue and red of Track Changes. It was the kind of work that demands the utmost in self-restraint, patience, and attention. You have to sit. You have to sit still, with your eyes fixed on a screen, for hours at a time. You cannot allow your mind or body to wander or you’ll miss stuff. Yes, I do have the Moon in Virgo but this is not my favorite part of copyediting. 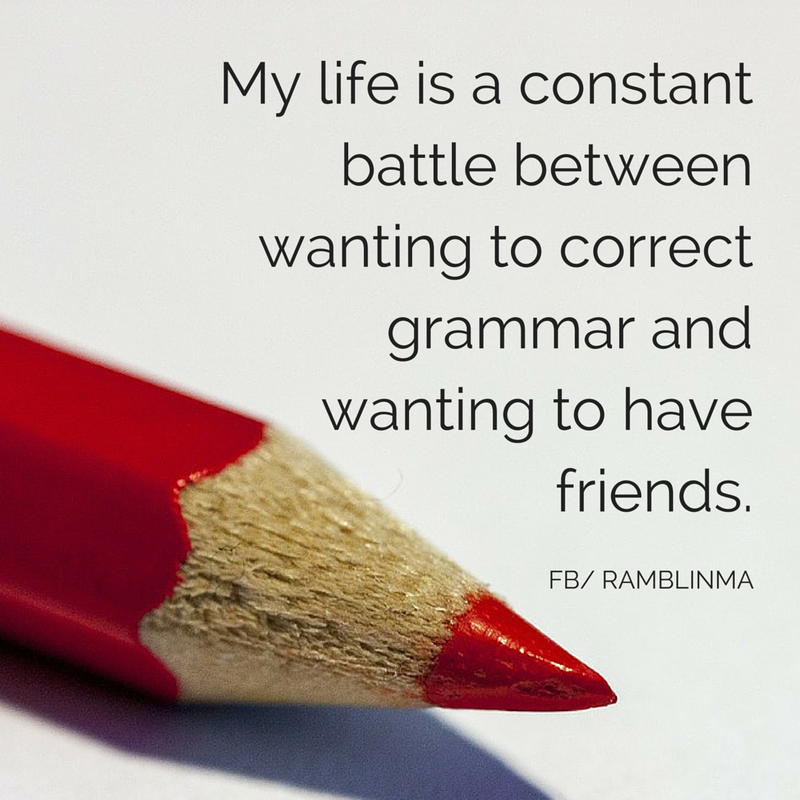 What really interests me is grammar and diction, the refinement of expression (i.e. I’m really an editor, not a copyeditor, but I don’t want the responsibility of being an editor—the part that’s a euphemism for “ghost writer”). The next morning I did my “sweeps”—going through the manuscript doing a “Find” on every digit from 0 through 9 to make sure I’ve treated numbers (and anything else in question) consistently. (How did we do this before computers?) Then I organized the stylesheet, under time pressure since the job was a day late. After it was all in, I kicked back and, in the mindless way you do while decompressing, read the first thing in front of me, which happened to be my own stylesheet. If you’re a copyeditor (or a copy editor) you will see that I went straight to hell in exactly the ways it was so important to stay buttoned up on the job. Nobody cares about this stuff on the Internet anymore, as long as readers can understand what’s being said (for science nerds only: I just read a WIRED article on the CRISPR-CAS patent dispute that misspelled the name of Jennifer “Dounda”), but if this incriminating document ever came to the attention of a copyediting department, especially someplace supercilious* like the University of Chicago Press (where an editor once made me copyedit my own résumé, then still didn’t hire me), I’d be drummed out of the profession. The stylesheet itself needed copyediting, but I didn’t take the time. . . .
It’s just littered of unclosed parentheses and quote marks, the occasional missing example, etc. . . . Reviewing this as I walked through the park to karate class to get the kinks out, I could not stop laughing. “It’s like those mechanics that only work on cars that go 200 miles an hour,” said David Remnick, The New Yorker’s editor . . . The metaphor seems irresistible. When I left my first job in New York — an editing job — and launched myself into the unknown of freelance writing, I explained my choice by saying, “I don’t want to be in the grease pit, I want to be on the track.” Forty years of writing later, I was taking care of a sick mate and didn’t have the uninterrupted concentration necessary to write. I returned to the grease pit and discovered that the two jobs no longer seemed mutually exclusive. Rather, they enhanced each other. I’ll expand on how they enhance each other some other time. But one of the ways surely is the fun of writing about copyediting. technically correct commas that might make a sentence sound better if omitted . . . This level of savoir faire, of discrimination, of delectation, is delectable. To switch metaphors (I know, it’s a no-no), you have to have a palate for it.